AADHAAR for CORPORATES? Government will evolve a scheme to assign a Unique ID for companies. Disinvestment target of Rs. 80,000 crore for FY 19. National Insurance Company, Oriental Insurance Company and United Assurance Company to be merged into one equity and subsequently listed. Government revises divestment target for the current fiscal to Rs. 1 lakh crore for FY 18. Government will contribute 12% of the wages of new employees in EPF in all sectors for next 3 years. Women contribution to EPF reduced to 8% for first 3 years. SEBI to consider mandating large corporations to meet 1/4th of their debt needs. SEBI to mull asking large companies to meet 25% debt from bond market. RBI norms to nudge companies to access bond markets for funds. The government’s emphasis will be on generating higher incomes for farmers, by helping them produce more with lesser cost, and in turn, earn higher income for their produce. FM Arun Jaitley stressed on the fact that India’s agricultural production is at a record high level today. 275 million tone food grains and 300 million tone fruits and vegetable have been produced in the country. Finance Minister said the government wants farmers to earn 1.5 times the production cost, and the Minimum Selling Price for the Kharif Crops has been set at 1.5 times the produce price. Jaitley said the Centre will work with states to ensure that all farmer get a fair price. Agricultural market and infra fund of Rs. 2000 crore fund will be set up to strengthen the market connectivity. A sum of Rs. 500 crore will be allocated for Operation Green to be launched. It will promote agricultural products. Extend the facility of “Kisan Credit Card” to fisheries and for animal husbandry. Rs. 10,000 crore set aside for “Fisheries and Aquaculture Development Fund”. Rs. 10,000 crore set aside for animal husbandry infra fund. Propose to launch a restructure bamboo mission with a fund of Rs. 1,200 crore. “Bamboo is Green Gold” . · Agricultural credit target increased from Rs. 8.5 lakh crore to Rs. 11 lakh crore. Railway capex has been pegged at Rs. 1.48 lakh crore, up from Rs. 1.31 lakh crore last year. Eliminate un manned railway crossing. More stations and trains will progressively be built with WiFi and CCTV cameras. Government to eliminate 4,267 un manned rail crossing in broad gauge in 2 years. Allocates Rs. 11,000 crore Mumbai rail network and Rs. 17,000 crore for the Bengaluru metro. 150 KM of additional suburban railway networks to be set up in Bengaluru at the cost of Rs. 17,000 core. Ayushman Bharat programme: 1.5 lakh centers will be set up to provide health facilities closer to home Rs. 1,200 crore to be allocated for this programme. Flagship National Healthcare protection scheme, with approximately 50 crore beneficiaries. Up to Rs. 5 lakh per family per year for secondary and tertiary care hospitalization. World’s largest government-funded healthcare programme. Universal health coverage will be expanded after seeing the performance of the scheme. Rs. 600 crore allocated for tuberculosis (TB) patients, at the rate of Rs. 500 per month during the course of their treatment. Finance Minister announces setting up of one medical college for every three parliamentary constituencies, with 24 New government medical colleges also being envisioned. Government also will work on upgrading hospitals to medical colleges. Rs. 1 lakh crore allocated to revitalization and up gradation of this sector. Promoting learning based outcomes and research. PM research fellows: Govt will identify 1000 B. Tech students each years and provide them to do PHDs and IIT and IISc, while also teaching undergraduate students once a week at that time. 85.51 lakh new tax payers filed income tax returns in FY 17. No personal income tax changes. Growth in direct taxes (till Jan 15) is 8.4 %. Surcharge of 10 & on income above Rs. 50 lakh but less than Rs. 1 crore to be continued next year; 15 % on income above Rs. 1 crore to also continue. 100 % tax deduction is allowed to co-operative societies. Corporate Tax of 25% extended to companies turnover upto Rs. 250 crore in financial year 2016-17. Incentives for Senior citizens: Exemptions in income of Rs. 10,000 from Banks Fixed Deposit and Post Offices. Senior citizens to get Rs. 50,000 per annum exemption for medical insurance under section 80D. Rs. 7.5 lakh per senior citizen limit for investment in interest- bearing LIC schemes doubled to Rs. 15 lakh. Standard deduction of Rs. 40,000 allowed for transport, medical reimbursement for salaried tax payers. Government to reduce hardships faced in reality deals; no adjustment to be made in case circle rate does not exceed 5 per cent of sales consideration. Long Term Capital Gains exceeding Rs. 1 Lakh will be taxed at 10 % without indexing. Short term capital tax remains at 15 %. A tax on distributed income at 10 %. Education cess increased to 4 per cent from 3 per cent to collect additional Rs. 11,000 crore. GST revenue will be received only for 11 months, that will have an effect on Balance Sheets. GST collections projections pegged at Rs. 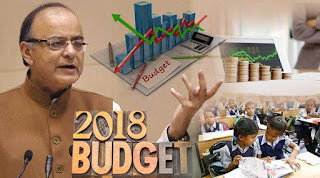 7.43 lakh core in full year 2018-19 as against Rs. 4.44 lakh crore in nine months of current fiscal. Government makes PAN mandatory for any entity entering into a financial transaction of Rs. 2.5 lakh or more. Custom Duty on certain products, such as mobile phones and televisions has been increased to provide a fillip to “Make in India”. Social welfare surcharge of 10 % on imported goods. Central Board of Excise and Custom renamed as Central Board of Indirect Taxes and Customs. Import of solar tempered glass for manufacture of solar cells exempted from custom duty. Custom duty on crude edible vegetable oils like groundnut out, sunflower seed oil hiked from 12.5 % to 30 %; on refined edible vegetable oil from 20% to 35%. Custom duty on imitation jewellery increase from 15% to 20%; doubled on all watches to 20%. Rs. 3,794 crore allocated to the MSME sector in the form of capital support and interest subsidy By 2022. Rs. 3 lakh crore target has been set for the Mudra Yojana. Rs. 4.6 lakh core sanctioned under MUDRA scheme. PM Saubhagya Yojana: 4 crore people will get power connection. The government will spend Rs. 16,000 crore on this scheme. Government plans to construct 2 crore toilets in next fiscal year under “Swach Bharat Mission”. Government target house for all By 2022. 51 lakhs houses have been constructed affordable houses in rural and further 50 lakhs houses in urban areas. 1 crore houses to be built under “Pradhan Mantri Awas Yojana” in rural areas. “National Livelihood Scheme” gets Rs. 5,750 crore. In 2018-19, ministries will be able to spend Rs. 14.34 lakh crores for creation of livelihood in rural areas. Government gives Rs. 9,975 crore for social security schemes for the next fiscal year. Excise on un branded diesel cut by 2 rupees to 6.33 rupees/ ltr. Excise on un branded petrol cut by 2 rupees to 4.48 rupee/ ltr. Airport Authority of India (AAI) has 124 airports. Propose to increase the number by at least 5 times in 1 billion trips a year, Rs. 60 crore has been allocated to kick start the initiative. “UDAN” Scheme to connect 64 unconnected airports across the country. Rs. 7,148 crore allocated for textile sector. PM Jivan Bima Yojana has benefited 5.22 crore families. Government will expand PM Jan Dhan Yojana: All 16 crore accounts will be included under micro insurance and pension schemes. 1.26 cr accounts opened under Sukanya Samridhi Scheme. Social inclusion schemes for Schedules Tribes Rs. 39,139 crore. India needs investment of Rs. 50 lakh crore in the infrastructure sector. Construction of new tunnes in Sera Pass to promote tourism. Out of 100 smart cities 99 cities have been selected, with an outlay of Rs. 2.04 lakh crore. 10 prominent tourist sites will be made iconic tourist destinations, with an amalgamation of private funding, marketing and branding. Bharatmala Project: To develop 35,000 KM under phase I with an outlay of Rs. 5.35 lakh crore. Govt to introduce pay-as-you-use system for toll payments. Allocation to Digital India scheme doubled to Rs. 3,073 crore. 5 lakh WiFi HotSpots to provide Bradband access to 5 crore rural citizens, at the cost of Rs. 10,000 crore. Government will take measures to stop crypto currency circulation, as it is not considered legal tender. Government will explore the usage of Block chain technology. Recapitalization will pave the way for public banks to lend an additional of Rs. 5 lakh crore. Defence outlay raise to Rs. 2.82 lakh crore in 2018-19 from Rs. 2.67 lakh crore in current year. Food subsidy to rise to Rs. 1.69 lakh crore in 2018-19 from Rs. 1.4 lakh crore in current year. Emoluments for: President set at Rs. 5 lakh, Rs. 4 lakh for Vice President, Rs. 3.5 lakh for governors. Emoluments for MPs: Law for increase in pay based on index to inflation. Government earmarks Rs. 150 crore to commemorate 150 years of birth of Mahatma Gandhi.